With Summer fast approaching, the days are getting warmer and we are able to spend more time enjoying the wonderful weather and out side play. Sitting in a classroom on a very hot day can lead to a little bit of frustration from our children. So what does our resident occupational therapist, Tasha-Leigh do? Hot weather = COOL WATER! 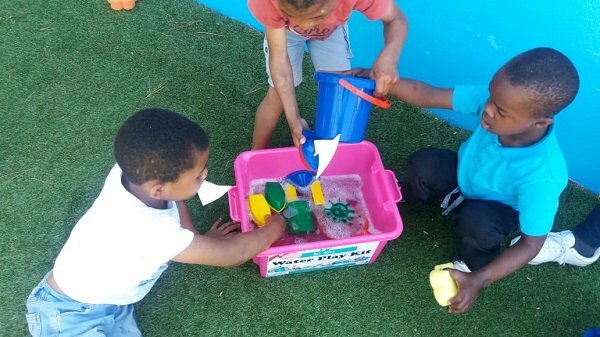 So many developmental actions are encouraged and enabled through water play such as physical, social, language and creative development. Physical – squeezing sponges, pouring water from various sized vessels, splashing and play all helps with hand eye coordination, as well as fine tuning gross and fine motor skills. Social – Working together and sharing the various items works toward teaching children to play together, to work together and to share the play items as well as the space at the larger water area. Language – Using new items teaches new words and new terms – this is so valuable with those of our kids that have limited language and speech. Creative – endless opportunities of trying out new and different ideas – even if this means seeing the reaction of splashing some water on a friend! Our children are all loving the warm water and learning through fun play! The best way to learn and have fun! All of our water play is conducted in a safe environment and under close supervision at all times!